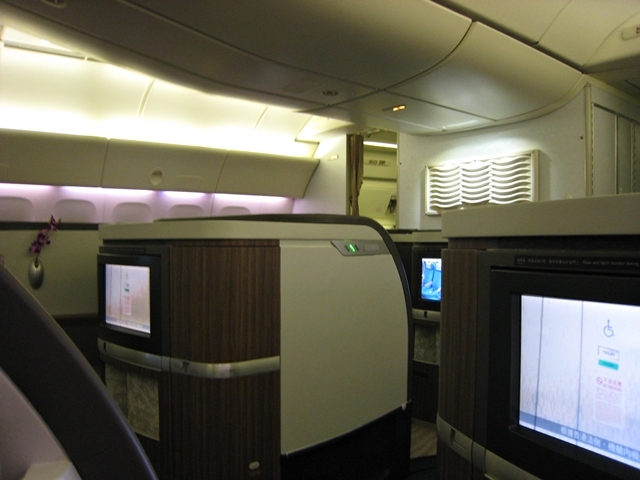 For our Cathay Pacific First Class award flight (which I often book for clients with my Award Booking Service), on the return my husband and I switched so that I could try first class with the munchkin. For this flight, there was only one other passenger in first class, so we had the cabin almost all to ourselves. I helped the munchkin get settled and read him some storie before take-off. 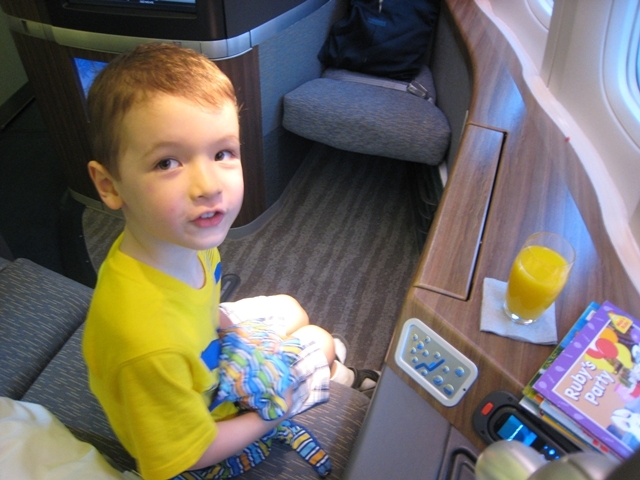 We were offered pre-flight towels and drinks, and the munchkin enjoyed orange juice. 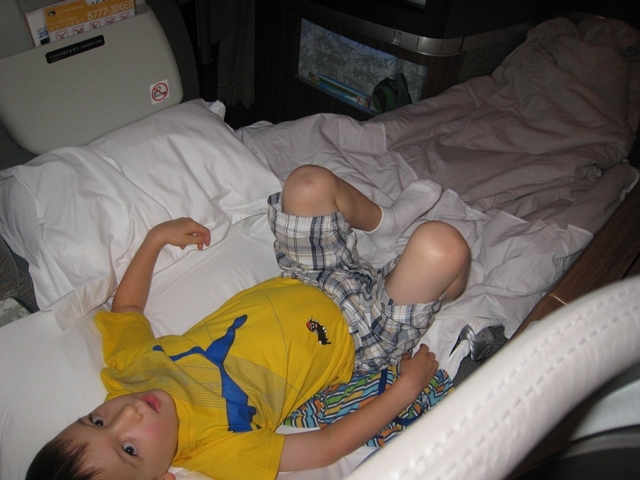 Although we were lucky enough to be seated in first class for the Bali-Hong Kong return flight and so the first class seat wasn't entirely new to me, I still was thrilled about the space-plenty of room to sit side by side with my son to read books, and the extra space also made the bed a lot more roomy. And of course leg room is simply not an issue for these suites, no matter how tall you are or how long your legs. 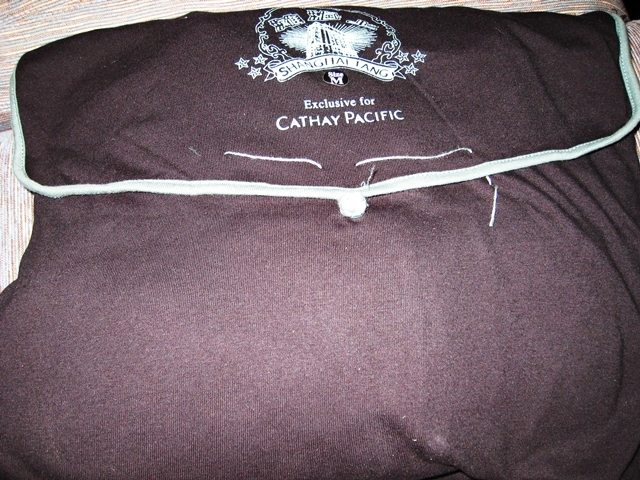 Prior to takeoff, I received a fabric case containing Shanghai Tang pajamas (even the smallest size would be too big for the munchkin as Cathay Pacific doesn't carry kids' sizes, so I declined them for the munchkin). When I later tried mine on, it was nice and soft, although a bit baggy and prone to lint as it's black. I loved that the women's Trussardi amenity kit featured luxury toiletries from Australian skincare specialist Aesop: Primrose Facial Hydrating Cream, Geranium Leaf Hand and Body Balm, Rosehip Seed Lip Cream, and B & Tea Balancing Toner. 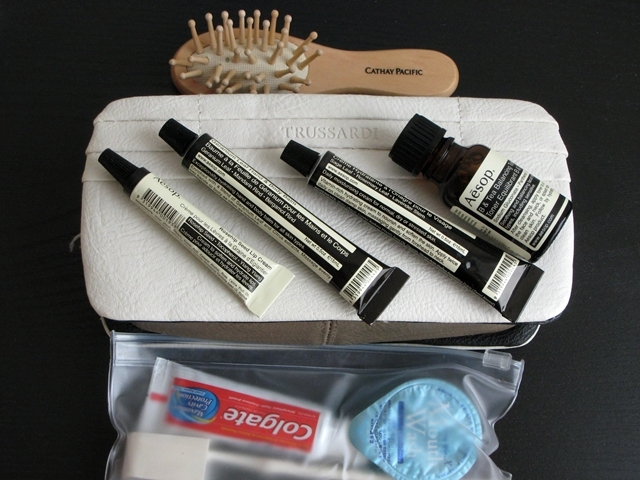 There was also a cute wooden Cathay Pacific brush and standard toothbrush, toothpaste, mouth wash, earplugs and tissues. 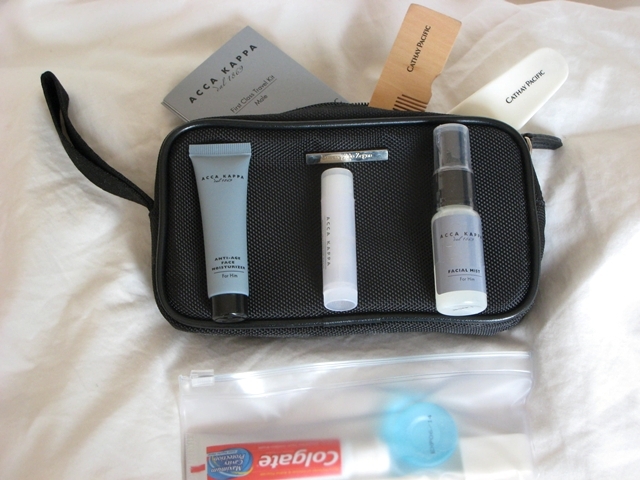 The munchkin obviously was too young to appreciate his amenity kit, but it included Acca Kappa Anti-age Face Moisturizer, Facial Mist, and Lip Balm along with a wooden Cathay Pacific comb and shoe horn. After take-off, we were given menus and wine lists, I'll post photos of both soon. Even though we'd already enjoyed some noodle soups in The Wing Lounge at Hong Kong airport, I at least had saved plenty of room for dinner and was quite hungry. 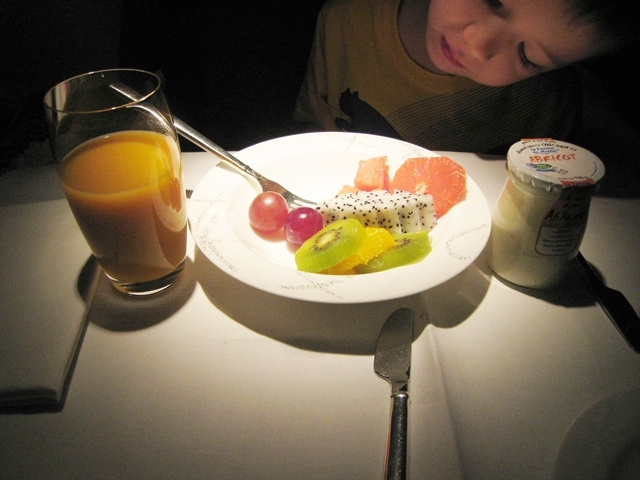 As on our flight from Bali to Hong Kong, I was able to dine across from the munchkin. We had already made his seat into a bed, so he sat on my chair and between courses watched a children's movie on the IFE, while I sat on the ottoman. I ordered the Caviar and Balik salmon for both the munchkin and me. While normally I'm not a huge fan of caviar, the pairing with Balik salmon was sublime. This is pretty much the best smoked salmon I've had anywhere. 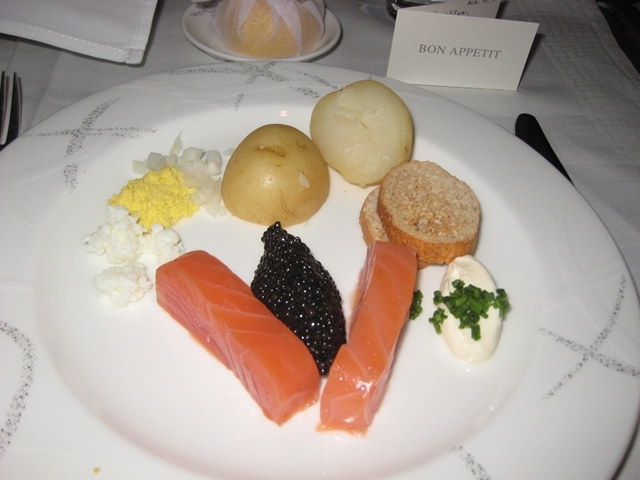 The munchkin apparently agreed, since he completely finished his portion of salmon, while I had nearly two portions of caviar with salmon and the accompaniments: sour cream, potatoes and hard boiled egg. This was definitely my favorite part of the meal. 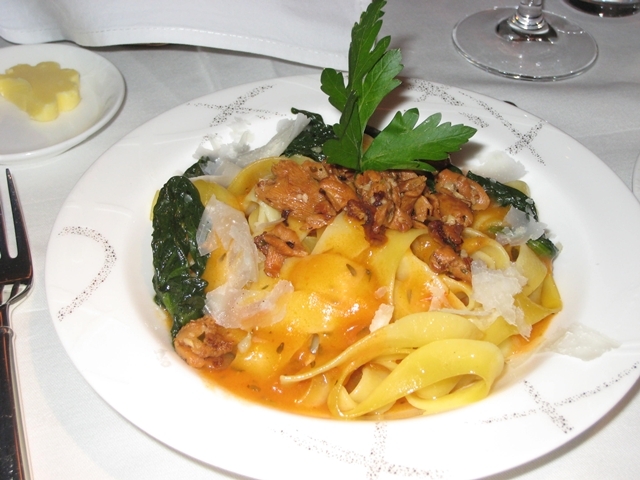 For my son I ordered the Fettucine with roasted red pepper thyme sauce, chanterelle mushrooms and sauteed spinach. The noodles and sauce were fine, but the chanterelles were the best part. Since the munchkin had filled up on salmon and garlic bread, he didn't really do this dish justice, but I think most vegetarians would have enjoyed it as well. 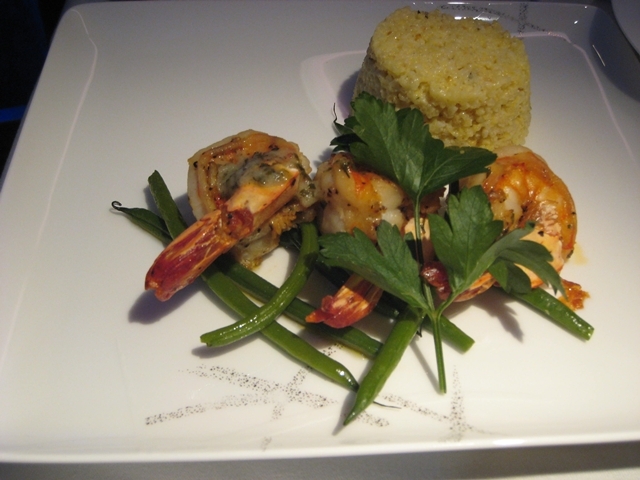 For myself I ordered the Pan-fried king prawns with garlic butter and herbs, millet with parsley, and French beans. The prawns were great, moist and perfectly cooked, and the modest portion was perfect given the caviar, salmon and chanterelles I'd already dined on. I accompanied with some Vincent Girardin Puligny-Montrachet Vielles Vignes 2008, since the only other white wine choice was a Chardonnay which wouldn't have been as good a pairing. 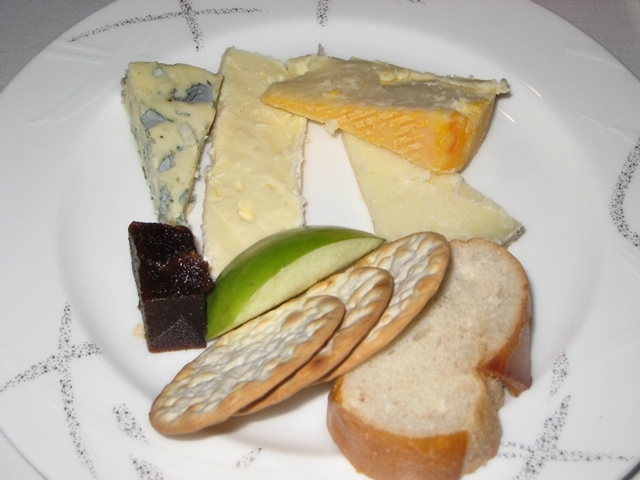 The cheese course consisted of four types of cheeses, French Brie, Arenberger, Manchego and Fourme d'Ambert, served with some apple slices, crackers and quince paste. All were solid, but I do wish airlines would take the cheese offering up a notch, at least in first class. Now, I realize this is Cathay Pacific and not Air France, so perhaps it's difficult with flights out of Hong Kong to offer the more interesting cheeses you get in Paris, New York, San Francisco, etc. But personally I'd love to see Pyrenees Brebis, Tete de Moine, Robiola and Saenkanter offered. In addition to the regular wine list, there was a promotion of 6 classified Bordeaux wines on offer. The flight attendants weren't too knowledgeable about the wine and hadn't tried any themselves, but they were very obliging in letting me sample both of the two they were carrying on the flight, as well as the Shiraz and Malbec from the wine list. At least for me, the Malbec was the winner–but I like fruit driven, intense, and very round wines, which doesn't exactly characterize most Bordeaux wines. After all that food and wine, I opted out of dessert and chose fresh berries with ginger syrup to share with the munchkin. 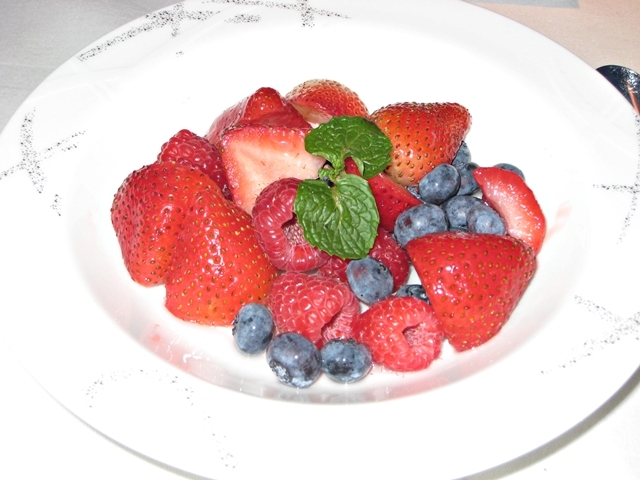 Lovely berries and just the right amount of syrup. 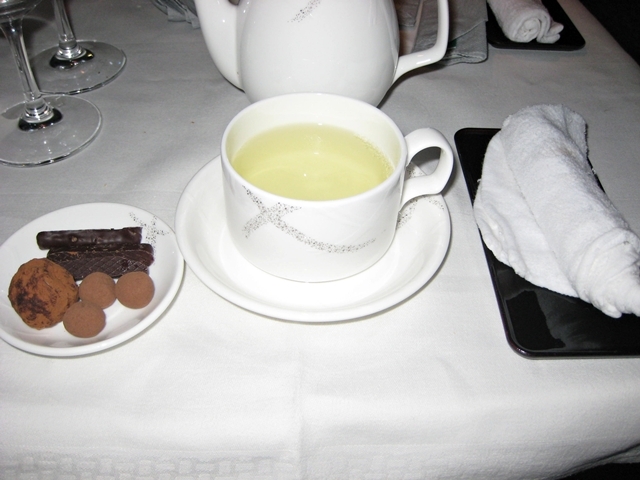 We finished off with pralines, and some green tea for me, with a hot towel afterwards. I settled the munchkin for bed, and after a little tossing and turning he slept for most of the flight, which the flight attendants commented on: “What a great sleeper!” Yep. When he's asleep, he's completely out, which is quite a blessing when traveling. The nice thing about first class is you do get a mattress pad. It's not that thick, but it did help me sleep much better than on the outbound flight I had in Cathay Pacific business class. 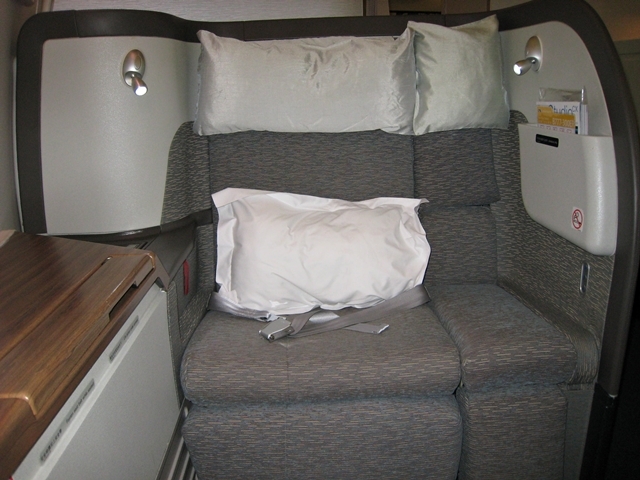 The privacy of Cathay's new business class is great and it is a flat bed seat, but I still had trouble sleeping in it. 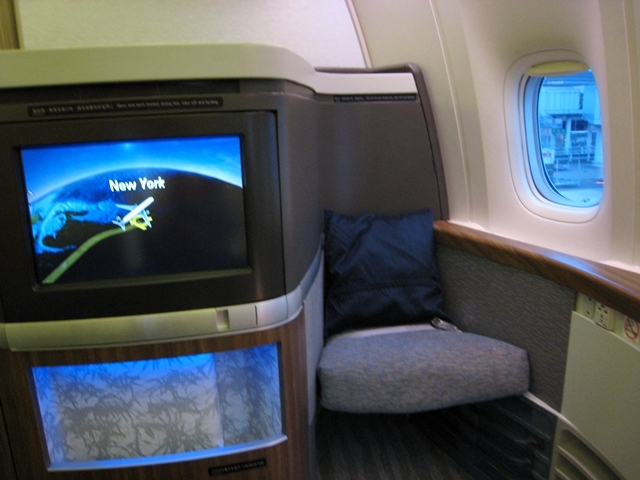 There's no question that in the future I'll save up enough miles to fly first class, if I can find award availability. When I did wake up, the munchkin was still sleeping so I got a little work done. I don't know what it is about flying, since it's not as if there's any physical activity involved, but I tend to get pretty hungry. I took a look at the snack menu and was intrigued by the Chinese Hot Pot, so I ordered that. The flight attendant warned me it would take about half an hour to prepare, but that was fine by me. 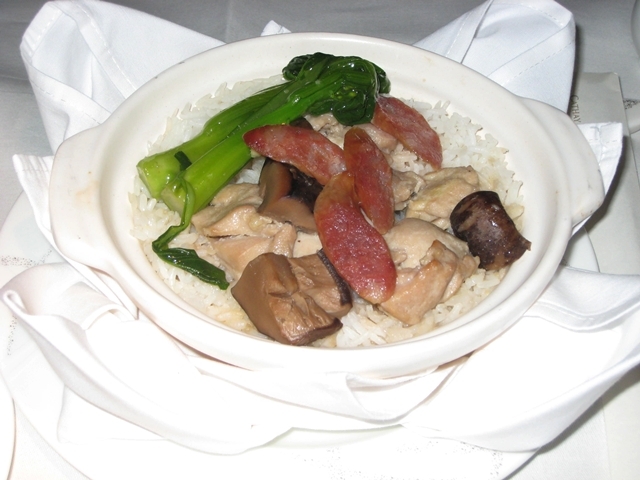 It came in its own clay pot, with chicken, mushrooms, Chinese sausage and choy sum. As is typical for Cantonese food, it was simple, but the soy sauce and chilli sauce it came with on the side were perfect to kick the flavors up a notch. 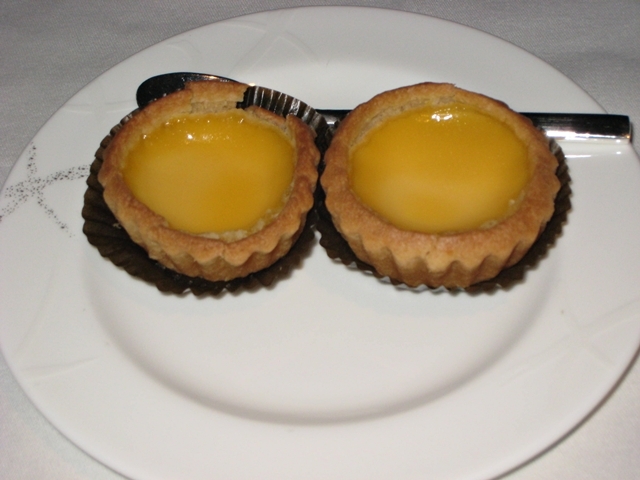 I also ordered Hong Kong style egg tarts. I let the munchkin eat one when he woke up, and took one home to eat later. It was good and seemingly fresh baked, although the crust wasn't quite as flaky as the one we'd gotten at a local bakery in Mongkok near the Langham Place hotel. For breakfast, the munchkin was content with orange juice, fruit, a croissant and jam, and some apricot yogurt from La Ferme du Manege. Thumbs up on the French yogurt–so much better than the usual commercial “yogurt” offerings from Yoplait (yuck) or even Danone. I couldn't resist trying the dim sum with chilli sauce for breakfast. While it couldn't rival the dim sum at Tim Ho Wan or my favorite NYC dim sum joint, it was beautifully presented (cute goldfish dumpling!) and tasty. Verdict: Fantastic flight–this is what everyone who thinks they hate flying should experience at least once, to see if they really hate flying or just hates the experience of flying in coach. The suites offer plenty of space and privacy, and I love that you can dine together with your companion. All the little touches, from the orchid in a holder to the pajamas, amenity kit, and being able to do some wine tasting with your cheese plate, add to the experience. 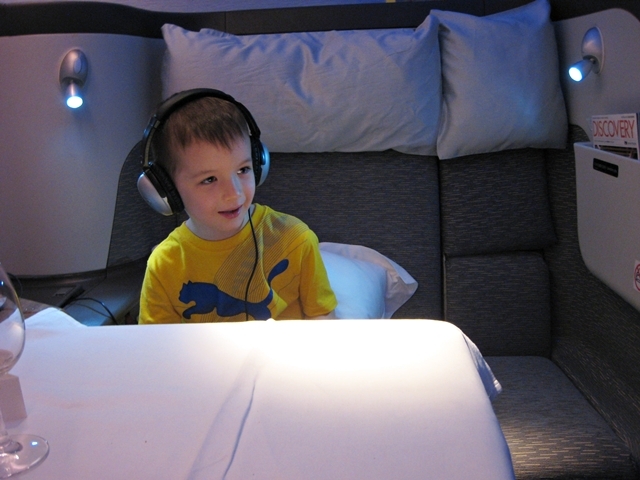 We were spoiled by stays in the Four Seasons, Mandarin Oriental, Amankila, and other luxury hotels on this trip, but I do think some kind of activity kit for kids would be nice (and of course not just for kids in first class–for kids in any class). For such a long flight, a booklet with mazes, coloring, etc. and some crayons would be a nice touch in addition to all the kids' programming in the IFE. Although this flight was part of a NYC-HKG-DPS-HKG-NYC itinerary booked with 150,000 British Airways miles (now Avios), British Airways has since devalued its award chart and your best option is to use 135,000 American Airlines miles for this itinerary, if you don't stop over in Hong Kong for more than 24 hours. If you do want to stop over in Hong Kong, you'll need to pay an additional 22,500 miles each way for Business Class between Hong Kong and Bali. Check out our recent post Earn 1 Million Miles and Points Without Flying for tips on earning the miles. 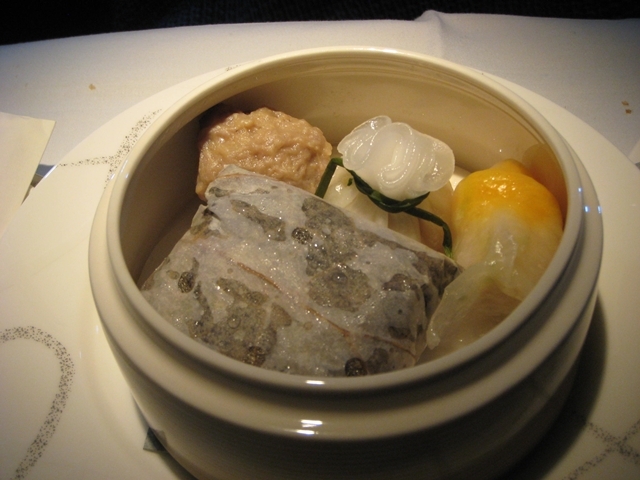 Have you enjoyed Cathay Pacific First Class? Share your experience!